This is the cover of my new comic! On November 6 last year, I went down to St Kilda Pier to wait for Julien Blanc to arrive. 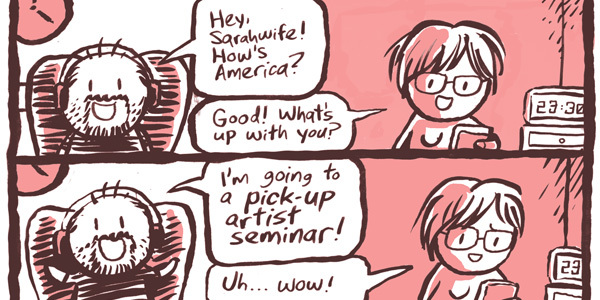 He’s an American “pro” pick-up artist (PUA). He teaches men how to meet women. After learning from him, he says, “you will know step-by-step what to do in all situations”. I enjoy making fun of pick-up artists, their silly codenames and their cryptic jargon, but their “sarging” tactics are sometimes pretty disturbing. And many guys, whether they know it or not, have female friends who’ve been hassled by these guys — sometimes the result is funny, sometimes wearying (they are generally taught not to take “no” for an answer) and, sometimes, frightening. But I’m a dude, so I get why we might go to hear a guy like Julien speak. And not everything PUAs teach is bunk. Like with any self-help cult, there’s bits of useful, sensible information in there — mixed in with worrying stuff which has a lot of anger at its heart. Like other small groups*, PUAs form tight-knit, often online-based communities which, when whipped into a defensive frenzy (defrenzy™) can have difficulty understanding the problems outsiders might have with them. Some of them are pretty nasty online. But I wanted to see Julien in person, hear what he had to say and meet some guys who listen to him. So I signed up to attend his free seminar! #takedown is about the people I talked to on the pier while we waited for our hero/villain to arrive. EDIT: why not tell people when/how they can get it? Good idea, David. 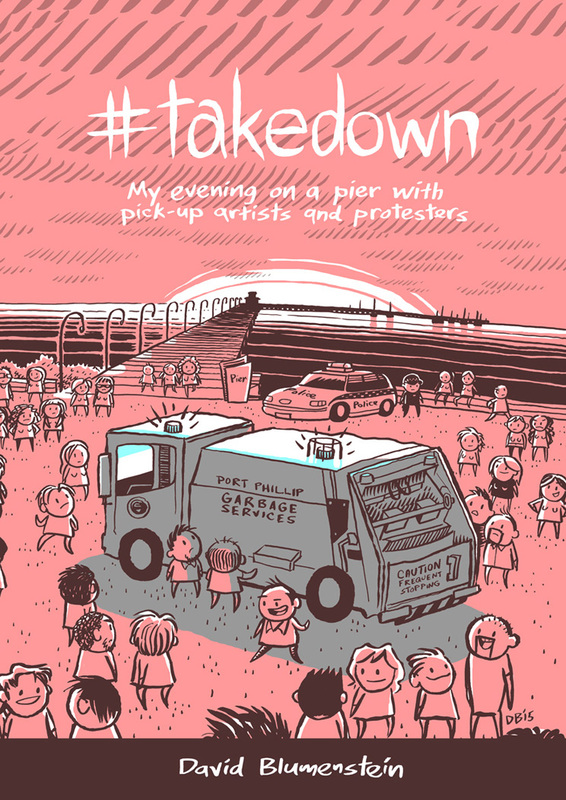 Pikitia Press is launching several new books they are publishing or distributing on March 27 at Silent Army Storeroom in Melbourne (these being DRAWN ONWARD by Matt Madden, MOWGLI’S MIRROR by Olivier Schrauwen, BLAMMO 8 1/2 by Noah Van Sciver, GUZUMO by Matt Emery and #TAKEDOWN by me). You can pick up an early copy there (we’re doing a small run just for the launch). Alternatively, you’ll be able to buy it online from Pikitia Press (if you’re a retailer or a library, why not do this? ), and then it’ll be available in bookshops from May.